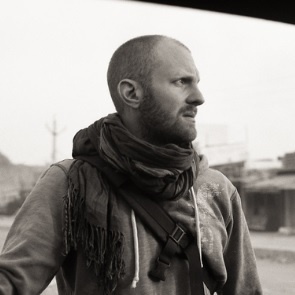 Highlands and Islands photographer and filmmaker Tristan Aitchison is representing ScreenHI and XpoNorth Screen and Broadcast at 2016's Edinburgh International Television Festival. ScreenHI has been a huge and vital support for myself and other emerging creatives from the Highlands and Islands and has played a pivotal role in progressing my career. 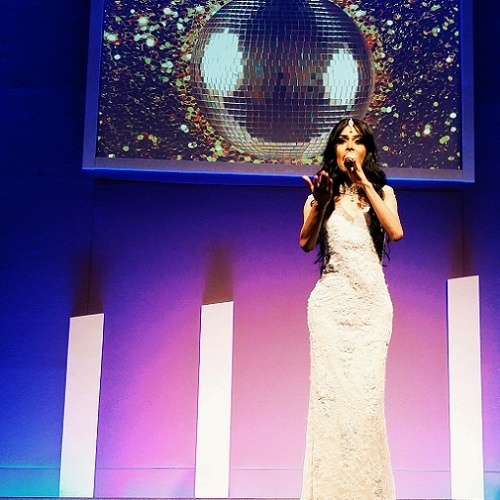 I was therefore delighted to be invited to represent them at the Edinburgh International Television Festival. My debut feature documentary Sidney & Friends about the Transgender and Intersex community of Nairobi in East Africa is in the final throws of post-production and will be released to the film festival circuit in January. Produced in association with ScreenHI and XpoNorth my presence at EITF is an added opportunity to network and speak to the people with influence. 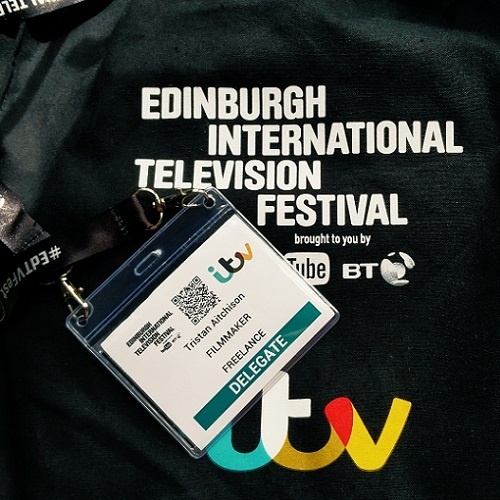 Image: Daily blog from Edinburgh International Television Festival from Highland Filmmaker Tristan Aitchison. Straight up I find festivals daunting. I’m naturally shy, find being in large groups difficult and small talk tiring. Attending festivals and networking events is a necessity within the film and television world and is something that I’ve learned to adapt to. Networking is much like dating. Now, I’m no expert dater and my continued checking of the single box on my annual self-assessment tax return is proof of this. However I learned, perhaps from Davina on Streetmate or Cilla on Blind Date, that to try and increase your chances of success on a first date is to apply the 7030 rule. You listen for 70% of the time and only speak for 30%. This works wondrously for networking. My other tip is just to be a nice person. It’s much easier to work with, help or share experiences with a nice person than an arrogant and self-absorbed one and there are many of those in this industry. Being from the Highlands and Islands we think we have to travel long distances and many hours to the Central Belt, London and beyond but spare a thought for the nice man I met at the Creative Diversity Network Drinks from SBS Australia who had flown over just for the tv festival. Diamond is a new initiative launched by the Creative Diversity Network in conjunction the major television networks. It’s a comprehensive online diversity resource and new diversity database to try and instigate and better track and promote diversity on and off screen. As a member of the LGBTI community and someone from a rural and isolated community, the Highlands and Islands, I have never seen my life reflected on screen. An initiative such as this is welcomed. Launched by a white male politician in a grey suit does prove how far we still have to travel for true equality in every aspect of our society. Image: Asifa Lahore, of C4’s Muslim Drag Queens fame performs Diamonds are Forever at Creative Diversity Network drinks. Diversity was also an essential thread in the next seminar, London 2012 to Rio 2016: The Superhumans’ Struggle for Equality. A fascinating discussion on the gains that have been made in representation of disability both on and off screen but also indicating that the broadcast industry has lost momentum. Day 1’s highlight undoubtedly was the MacTaggart Lecture with Shane Smith the founder and CEO of Vice. An awe-inspiring hour focussing on diversity, environment and social justice content in the new media landscape. To save my word count and so I can get to bed and feel fresh for Day 2 there’s a full rundown of his lecture in The Guardian. 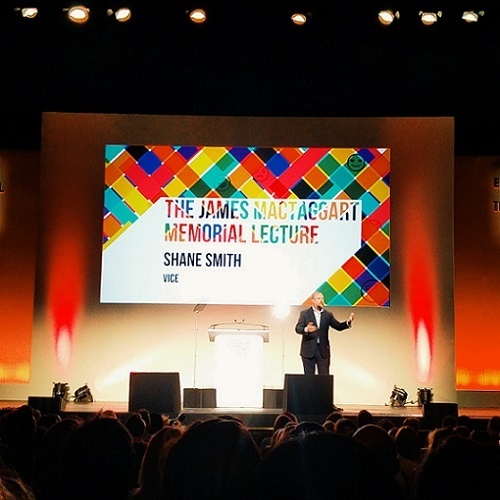 Image: Shane Smith, CEO and founder of Vice, delivers a barnstorming MacTaggart Lecture. You’ll be wondering how I could start my Day 1 recap of the Edinburgh International Television Festival talking about dating and manage to come full circle. In telly land anything is possible, just ask the showrunner for Outlander and writer of sci-fi hits Star Trek Next Generation, Deep Space Nine and Battlestar Galactica, Ronald D. Moore. In his Masterclass: From Star Trek, Outlander & Beyond he revealed how he got his first break in television. He was dating a girl who saw a poster of Captain Kirk on his bedroom wall. She happened to work at the studio where Star Trek was filming and said she could get him a very hard to come by tour of the set. She did and he handed over an episode of the show he had written and his career then went in to light speed...well after the teleplay languished in the slush pile for unsolicited scripts for 7 months. That’s the circle squared. Networking is very much like dating and if you Klingon long enough it’s pretty much the same thing.